This blog starts a short series of reviews of recent papers on Zimbabwe. First up is an excellent paper by Grasian Mkodzongi (from the Tropical Africa-Land and Natural Resources Research Institute in Harare) and Sam Spiegel (from the University of Edinburgh) in the Journal of Development Studies, entitled “Artisanal Gold Mining and Farming: Livelihood Linkages and Labour Dynamics after Land Reforms in Zimbabwe”. In the post-land reform setting, the relationship between farming and small-scale artisanal mining is increasingly important (see an earlier blog). This is especially so in areas where there are large mineral deposits, such as along the Great Dyke, as in the study area in this paper in Mhondoro-Ngezi near Kadoma. Sam Moyo described the land reform as ‘liberating’ natural resources, and those who took the land have exploited mineral resources as a complement to farming, either through opening up new areas or mining old deposits. Gold is a key mineral resource and mining takes many forms, ranging from exploitation of alluvial sources along rivers and streams, or digging below ground to seams below. 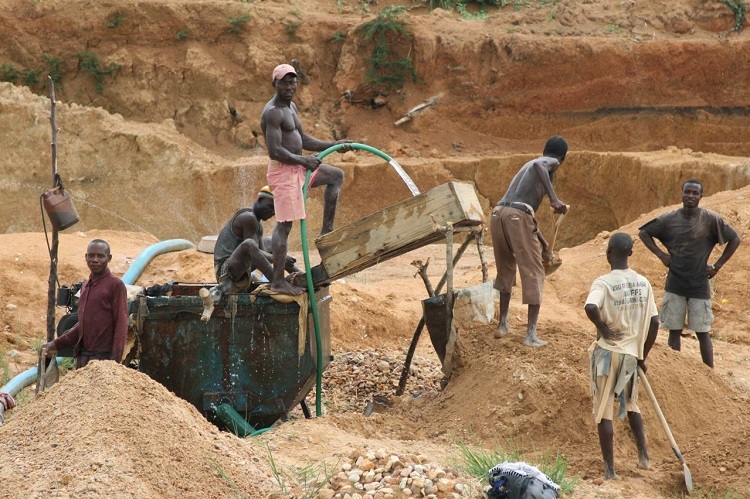 Small-scale artisanal mining, however, very often remains illegal and criminalised, making the negotiation of access to new mineral resources tricky. The paper explores three neighbouring farms, which are now A1 settlements and examines the different associations with mining among a complex network of actors. In particular, the paper explores differential accumulation dynamics in artisanal mining, and the complex links between farming and mining. Based on qualitative interviews, the paper offers some interesting profiles of people who combining mining and farming in different ways. There is huge differentiation in roles and opportunities for accumulation. Young men in particular are involved in the hard labour involved in mining. Many come from other areas, and work in the land reform farming areas, often in cooperative groups. Those with land in the resettlement areas may hire in groups of labourers to exploit deposits in their areas, working out a share of profits. Farmers may provide equipment, or they may join up with others to supply the range of digging and processing equipment required. Key players are ‘sponsors’ who allow the sale of gold. They may have contracts with the government-sanctioned buyers, or they may engage in illegal trade, linked to smuggling networks to South Africa. The ‘sponsors’ include a mix of politicians, security personnel, civil servants and others with political connections. Able to manoeuvre through the system (or avoid it), they are able to extract significant surpluses from the growth of artisanal mining. That much of it remains illegal is to their advantage, as they can exploit the system. Joining the local group of ‘sponsors’ are others too. Chinese entrepreneurs are involved, either in the buying trade or in support for extraction through the supply of equipment and contract arrangements with farmers with deposits or labourers digging or panning. The paper offers some insights into the murky networks of sponsors, illegal trade and political patronage, but – for obvious reasons – much of this remains opaque (see discussion in another blog). As a result of this complex set-up, the relationships between mining and farming livelihoods are varied. Unlike their counterparts in the cities who have no jobs and increasingly limited opportunities (as seen with the riots in January), rural youth can migrate to mining/gold panning areas in search of work. Operating in cooperatives, they may be able to bargain, but the terms are poor. Work is harsh and dangerous too, and returns are small. This is survival labour rather than offering any opportunity for improvement. However for their livelihoods, and for those of their immediate kin, living either in the area, or often in the areas to the north, where mining has long been a key part of livelihood activity, these meagre earnings are important. For those with land, the benefits of land reform include not only the opportunity to farm on larger plots, but to exploit the mineral resources below ground. Many do not have formal permits, but illegal operations continue. In areas, such as the study areas reported on in this paper, the land is pock-marked with old shafts and mining pits, often long-abandoned. These have may have been rehabilitated by farmers, although certainly not to any approved safety standard. New deposits have also been found in many farms, both on the surface and below ground, and these too have attracted investment to ensure exploitation. This involves the mobilising of resources for equipment, as well as labour. The relationship between farming and mining is complex. Some shift towards mining but keep their plots going for subsistence food, including feeding mining labour. Others see mining as a complement to farming, which remains the more stable, secure income source. As interviews in the paper noted, mining requires patience. You may not find anything for ages, and so need other sources of income, and food, to keep going. But sometimes it pays dramatically, and this new source of funds can be vital for new investment – both on and off the farm. As the paper outlines, the way mining revenues are invested varies between different people. For labourers, immediate consumption items may be the most important, notably food. However, for others, particularly with mining windfalls, there are opportunities for investing in farming, housing or other assets, such as livestock, or alternatively in off-farm businesses, including in local towns. Who invests in what, the paper suggests, depends on their origins. The new resettlements include people from all walks of life. Most came from other rural areas, and they see farming as the best route to livelihood improvement. Others came from town, and they have aspirations and connections to allow investment in businesses and other urban-based enterprises that become linked to their farming and mining operations. Across the gold value chain, there are varied accumulation opportunities. Some are able to move up the value chain, buying equipment, establishing more formalised arrangements, and moving into dealing. Others, as mentioned, invest their resources in improving farming or setting up off-farm businesses. Unlike in other cases of mining booms elsewhere in Africa (or indeed in Zimbabwe, such as the early Marange diamond rush), there is less ‘hot money’, involving ostentatious consumption and purchasing of flash items. It happens, but for most involved, the focus is on improving livelihoods, investment and accumulation. Those in these rural settings are thus ‘accumulating from below’, making use of local resources to invest and improve livelihoods through different pathways. However, there are also those ‘accumulating from above’, engaged in what the paper sees as ‘primitive accumulation’ through direct exploitation. The use of political patronage networks to capture trading opportunities means that the ‘sponsors’ – the king-pins in the value chain – can call the shots, and make serious money. Here investment is focused in bigger business investments – from networks of shops to transport businesses and so on – with some having connections outside the country, making sure new mineral wealth is protected from the chaos of the Zimbabwe economy. This trajectory of accumulation is not available to anyone. You can move up the value chain only so far, as these key positions are protected through networks and connections. These of course shift with the political winds, but those involved in production rarely get a look in. The paper therefore paints a diverse picture of social differentiation and patterns of accumulation, linked to complex intersections of farming and mining. This is a poorly understood, yet important, dynamic. Moves to legalise and formalise artisanal mining through the offering of permits and licenses are afoot, but it will be important to have more studies of this sort that examine the complexities of mining-farming relationships and the economic, social and political dynamics of gold value chains to assess whether such moves will have the desired impacts. Given Zimbabwe’s mineral-rich geology, mining and farming (as happened before on the large-scale farms) will always be intimately connected, at least in some parts of the country. Thinking about the use of resources – both land and minerals – in an integrated way, and how their use affects different livelihoods, is an essential task. This paper is an important contribution towards this aim. This post was written by Ian Scoones and first appeared on Zimbabweland. All too academic. Couldn’t sleep one night several years ago due to people talking. Went out and through moonlight saw a couple of fellows sitting on the other side of the road outside the fence. Told them they couldn’t stay there all night and that they should be on their way. Astonished when about 20 stood up and walked off heading for the tar. They were fleeing the riot squad who had descended on a gold rush on nearby a1 farms.